Apr 21 - IMF and World Bank meetings begin amid concerns of faltering global cooperation. Eric LeCompte speaks on VOA New's "Straight Talk Africa" special. Read the IMF's World Economic Outlook April 2017 Report. Apr 19 - Global economic risks ahead, warns International Monetary Fund. Apr 18 - IMF warns of "protectionism" and risky investing; predicts steady growth & calls for cooperation on taxation‎. Apr 5 - Congress introduces legislation to close tax havens and curb corruption. Apr 3 - More than 11 million documents were leaked from a law firm based in Panama a year ago today. Mar 22 - Religious leaders encourage Congress to expand health care coverage to the citizens of Puerto Rico. Mar 17 - G20 Finance Ministers discuss debt reduction, tackling global tax avoidance and trade policies at a Germany meeting. Feb 23 - The Treasury renews requirements for title insurance companies to identify the real owners behind shell companies in six major metropolitan areas. Feb 14 - President Trump signs a Congressional resolution to void transparency requirements in the oil, gas and mining sectors. Jubilee's views are featured in Agence France Presse, The Guardian and Public Finance International. Jan 12 - Ecuador Foreign Minister Guillame Long meets with civil society groups to discuss tax avoidance, corruption and development. Dec 31 - Your support won big victories in 2016 to fight poverty. Read our Year-End Report. Feb 3 - The Senate voids a rule requiring greater financial transparency in the oil, gas and mining industries. Feb 1 - The House of Representatives repeals a bipartisan transparency initiative that affects the oil, gas and mining sector. Jan 31 - The US House of Representatives considers repealing a bipartisan transparency initiative that affects the oil, gas and mining sector. Jan 26 - Congress considers repealing a bipartisan anti-corruption law. Jan 12 - Haiti's debt approaches $2 billion as it recovers from Hurricane Matthew and remembers the devastating earthquake that shattered the country seven years ago. Dec 30 - The US Virgin Islands faces similar debt troubles as Puerto Rico. The US territory could opt-in to Congressional legislation passed to address Puerto Rico's debt crisis. Dec 22 - The rating agency S&P downgrades the Bahamas' debt to "junk" status. Dec 15 - Venezuela misses a self-imposed deadline for introducing larger bills to address inflation. Dec 8 - The President can now impose economic sanctions on individuals involved in corruption or human rights abuses thanks to action by Congress. Dec 1 - Jubilee USA and Bread for the World honor House Financial Services Chair Emeritus Spencer Bachus for his leadership and courage during his time in Congress. Bachus championed the cause of debt relief for the world's poorest countries. Nov 25 - The future of a federal consumer watchdog agency is uncertain. Nov 21 - Puerto Rico Governor Alejandro García Padilla refuses to submit a revised fiscal plan to the territory's federal oversight board. Nov 10 - Jubilee USA honors its bipartisan champions at a special dinner at the US Capitol, including former Alabama Representative Spencer Bachus. Nov 9 - Archbishop Silvano Tomasi, former Ambassador from the Holy See to the UN, speaks at Catholic University on building an inclusive economy. Nov 8 - Donald Trump wins the US Presidential election. Jubilee's views on the election are featured in America Magazine, Devex and Catholic News Service. Oct 31 - Eric LeCompte, Jubilee's Executive Director, speaks at the United Nations on sovereign debt restructuring. Oct 24 - The Venezuela state-owned oil company finalizes a debt swap, substantially reducing its risk of default. Oct 14 - Puerto Rico's Governor submits a fiscal plan to the new Puerto Rico Financial Oversight and Management Board. Oct 6 - IMF/World Bank Annual Meetings begin in DC amid sluggish growth projections. Oct 5 - The International Monetary Fund (IMF) releases a biannual report on global financial stability. Oct 4 - The International Monetary Fund (IMF) releases its bi-annual report on the global economy, noting that growth is "subdued" and uneven. The Fund extended zero-interest loans to low-income countries. Sept 29 - The Puerto Rico oversight board holds its first meeting and an independent group of experts forms to monitor its actions. Sept 23 - A UN body warns the global economy is in "a fragile state" as they launch a new report with the Vatican. Sept 21 - The International Coalition of Investigative Journalists releases 175,000 records of companies incorporated in the Bahamas in the "sequel" to the major Panama Papers leak. Sept 15 - Mozambique President Nyusi meets with the International Monetary Fund (IMF) and World Bank in Washington, DC as debt and corruption concerns loom. Jubilee USA's thoughts on the meeting were featured in Voice of America, African Business Review, and Reuters. Sept 12 - A new report notes growing corporate offshore tax avoidance practices and urges the US government to intervene. Sept 9 - Zika researchers connect the disease's spread to poverty in Brazil. A new report shows birth defects in Brazil nearly doubling after Zika struck. Sept 5 - The G20 addresses debt and illicit financial flows in its final summit communique. Aug 23 - A new report highlights the link between the opioid epidemic and anonymous shell companies. An organization representing major US banks endorses a bill to curb corruption and crime facilitated by those companies. Aug 9 - An organization representing major US banks endorses a bill to curb corruption and crime facilitated by anonymous shell companies. July 26 - New documents from the "Panama Papers" leaks connect anonymous shell companies to corruption schemes in Africa. July 22 - Member countries of the United Nations Conference on Trade and Development (UNCTAD) renew the agency's mandate. July 20 - Cardinal Peter Turkson calls on a United Nations development summit to address the debt, tax, trade and environmental policies that impact poverty as negotiators struggle for agreement. July 13 - Google institutes a ban on payday lending ads on its website. July 1 - Puerto Rico defaults on its debt one day after President Obama signs Puerto Rico debt crisis legislation into law. The US Senate voted 68-30 to pass the legislation on June 29th. Read about Jubilee's perspective in the Washington Post, Catholic News Service and Agence France-Presse. June 29 - The United States Senate plans to vote on the Puerto Rico Oversight, Management and Economic Stability Act to address the island's debt crisis. June 8 -Jubilee USA, Catholic Charities USA and the United Church of Christ endorse Puerto Rico debt legislation and an amendment to address child poverty in the US territory. June 2 - The Consumer Financial Protection Bureau releases new rules governing "payday" lending. May 31 - The New York Times endorses legislation to address Puerto Rico's debt crisis. May 25 - The House Committee on Natural Resources votes 29-10 to approve Puerto Rico debt legislation and send it to the full House of Representatives. Read Jubilee's views in the Wall Street Journal. May 24 - Congress begins deliberations on new legislation to resolve Puerto Rico's debt crisis. May 18 - Representative Sean Duffy (R-WI) introduces a new version of legislation to help resolve Puerto Rico's financial crisis. Read Jubilee's analysis in Sojourners, Washington Times and the National Catholic Reporter. May 6 - The White House announces new actions on corruption and tax evasion in the wake of the "Panama Papers" leak. May 2 - Puerto Rico is set to default on most of $422 million in debt payments due. Read Jubilee's views in the Wall Street Journal, Politico, Foreign Policy and TeleSUR. Catholic Charities USA and the US Conference of Catholic Bishops write separate letters letter to Congress urging action on the crisis. Apr 25 - Nepal faces significant humanitarian challenges a year after its devastating earthquake and debt and corruption hinder its recovery. Apr 19 - Argentina returns to the bond market after settling its debt dispute with hold-out hedge funds. Apr 19 - As Congress debates legislative solutions for Puerto Rico's financial crisis, reports indicate that the island's child poverty rate is worse than previously feared. Apr 15 - House Republicans meet to discuss Puerto Rico legislation as Jubilee USA writes a letter to Congress advocating passage with key changes. Apr 14 - The International Monetary Fund includes Puerto Rico in its economic database amid the island's growing debt crisis. Apr 12 - As legislation advances to address Puerto Rico's financial crisis, the island's Catholic Archbishop invites prayers for Congress, creditors and political leaders. Apr 6 - The House Committee on Natural Resources is poised to release the newest draft of Puerto Rico legislation amid tense negotiations. Apr 3 - The "Panama Papers" leaks reveal how the global financial system enables corruption and tax evasion. Congress can act by passing bi-partisan legislation that makes it harder to create "anonymous shell companies" in the United States. Jubilee's views are featured in the Guardian, ValueWalk and the global news wire Agence France-Presse. Mar 29 - The House Committee on Natural Resources releases draft legislation addressing Puerto Rico's debt crisis. Mar 25 - A new report suggests Florida residents paid up to $2.5 billion in "payday" lending fees. Mar 17 - Puerto Rico's Governor says Congress should protect the territory from debt litigation until proposed Congressional solutions to its debt crisis are in place. Mar 16 - Argentina's lower house of Congress repeals two laws that blocked the country from settling its debt dispute with a group of hedge funds. Mar 4 - Jubilee USA launches its Puerto Rico radio spots in the critical presidential primary state of Florida. Feb 28 - Argentina settles a long-standing dispute with hold-out hedge funds, validating a predatory business model. Jubilee USA's views are featured in CNN and ValueWalk. Feb 26 - Jubilee USA launches radio spots focusing on Puerto Rico's debt crisis ahead of "Super Tuesday" presidential primary elections. Feb 19 - A US Judge lifts injunctions on Argentina, possibly leading to an end of its decade-long debt dispute with "hold-out" hedge funds. Feb 17 - Former South African President Mbeki visits the US to draw attention to how the developing world loses money to corruption. Bipartisan legislation in Congress would fight corruption facilitated by US-based "anonymous shell companies." Feb 15 - Puerto Rico's House passes a reform bill in an effort to secure a deal to restructure its public utility's debt. Feb 12 - A U.S. judge may lift sanctions related to Argentina's debt dispute with a group of "hold-out" hedge funds. Feb 3 - Bi-partisan legislation launches to stop criminals and the corrupt from using anonymous shell companies to move dirty money into the United States. Feb 2 - Our executive director, Eric LeCompte, testifies at a congressional hearing on Puerto Rico's debt crisis. Read Eric's testimony and see coverage of the hearing and our views in El Nuevo Dia. Jan 29 - Puerto Rico's government meets with investors to propose updates to a possible debt deal. Jan 21 - Puerto Rico's government continues to cut services as its economic crisis worsens. Jan 15 - Presidential candidates from both parties want to end the practice of corporate "inversions" - which drains billions from US taxpayers. Jan 13 - Argentina begins negotiations with groups that sued the country for more than $1 billion after the country's 2001 default. Jan 12 - President Obama argues for policies that address inequality during his final State of the Union speech. Dec 30 - Puerto Rico's government announces that it will default on at least $37 million of its roughly $1 billion debt payments due on New Year's Day. Dec 22 - The Census Bureau estimates that Puerto Rico lost 10% of its population over the past decade, with most of the decline coming during the island's economic crisis. Dec 18 - Congress passes the Omnibus spending package without bankruptcy protection for Puerto Rico. House Minority Leader Nancy Pelosi introduces a bill to shield Puerto Rico from lawsuits related to its debt until Congress addresses the island's fiscal crisis. Jubilee's views on Congress and the Puerto Rico debt crisis are featured by Univision. Act today - call on Congress, the US Treasury and the Federal Reserve to intervene in Puerto Rico's humanitarian crisis. Dec 9 - Republican Representative Sean Duffy introduces a bill granting Puerto Rico access to the same bankruptcy protection available to US cities and states. Dec 8 - At the United Nations, San Juan's Archbishop, Roberto González Nieves, calls on "vulture funds" to "come to the table" and negotiate a "comprehensive" solution to Puerto Rico's debt crisis. Dec 8 - Pope Francis begins the Jubilee Year with its themes of mercy and solidarity with the poor. 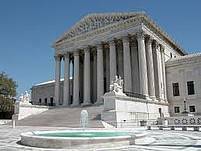 Dec 4 - The US Supreme Court announces it will review a court decision blocking Puerto Rico from using its courts to restructure debt. Dec 1 - Puerto Rico makes a $354 million bond payment, narrowly avoiding default. The United States Conference of Catholic Bishops releases a letter urging Congress to grant the island bankruptcy protection. Dec 4 - China's President Xi announces a $60 billion debt relief and financing package to African countries during a China-Africa summit. Dec 1 - Read "One Important Stat," a special Giving Tuesday message from our Executive Director Eric LeCompte. Nov 27 - Puerto Rico may default on a looming $354 million December 1 debt payment. Nov 25 - Presidential candidates from both parties criticize Pfizer's proposed "corporate inversion." Inversions could cost the US government nearly $20 billion over the next decade. Nov 20 - Puerto Rico's Government Development Bank meets with firms that own Puerto Rico's debt to present proposals to resolve the island's debt crisis. Nov 16 - G20 leaders focus on economic stability during their annual summit and call on Congress to pass International Monetary Fund voting reforms. Nov 13-15 - More than 100 communities joined together across the country for Jubilee Weekend 2015. This year's theme was "Let There Be Light" as we acted and prayed for financial transparency to protect the most vulnerable. Oct 9 - A predatory hedge fund threatens to use a trade tribunal system to sue Peru for $5 billion for 40-year old debts. The global wire service Agence France-Presse and Valuewalk feature our views. Oct 7 - The IMF releases its latest World Economic Outlook report, downgrading the global growth forecast and warning of rising debt levels. Its Global Financial Stability Report notes improved economic stability worldwide but increased risk for emerging economies. Foreign Policy Magazine features our Executive Director Eric LeCompte's views. Sept 29 - The Archbishop of Puerto Rico, Roberto González Nieves and Reverend Heriberto Martínez Rivera, General Secretary of the Puerto Rico Bible Society, visit Washington, DC to call on Congress to intervene in Puerto Rico's economic crisis. They join members of Congress at a congressional briefing to call for solutions that invest in Puerto Rico's people. Catholic News Service covered the Archbishop's visit. Read the his remarks at the congressional briefing here. Sept 23 - Pope Francis arrives in the United States. Global poverty will be front and center as he speaks to Congress, the White House and the United Nations. Jubilee's views feature on CNBC, the Miami Herald, the Sacramento Bee and in thousands of news outlets around the country. You can also read our opeds: Pope Francis in His Own Words and Jubilee Protects All of Us. Sept 10 - The United Nations votes 136-6 to adopt debt restructuring principles to stop financial crisis as part of broader efforts to create a global bankruptcy process. The vote comes two months after Pope Francis endorsed a bankruptcy process for countries. Aug 31 - Puerto Rican religious leaders call for solutions to their island's economic crisis and ask the US government to intervene. More information about Puerto Rico's debt crisis is available in Spanish and English on our website. The religious leaders' statement is also available in Spanish and English. Take action today - sign our petition calling on the White House, Federal Reserve Board and Congress to act to protect Puerto Rico's poorest. The Archbishop of Puerto Rico praises our efforts and calls on Congress to act in an op-ed in TIME Magazine. Jul 28 - The United Nations adopts 9 principles to create a global bankruptcy process. The vote comes two weeks after Pope Francis endorses a bankruptcy process for countries, one of Jubilee's core policies since our founding. The International Business Times and ValueWalk feature our views. Jul 24-26 - More than 60 Jubilee faith communities in 26 states act and pray for solutions to the student debt crisis as part of Jubilee for Students Weekend. Meanwhile, a US government agency issues a first-of-its-kind fine for predatory student lending practices. Jul 16 - The Archbishop of San Juan, Puerto Rico, calls for Congress to grant the island bankruptcy protection. In an op-ed in TIME Magazine, he applauds Jubilee USA for our debt relief efforts and calls for a global bankruptcy process. The Associated Press, New York Times and LA Times feature Jubilee's views on the Puerto Rico debt crisis. Jul 14 - Pope Francis calls for a global bankruptcy process for countries, one of Jubilee's core policies since our founding. Jul 13-15 - World leaders gather in Addis Ababa, Ethiopia this week to address global debt, tax and trade policies at the UN Financing for Development Conference. Our executive director Eric LeCompte spoke at the summit on solutions to predatory financial activity against developing countries. Jul 13 - Greece and its lenders agree to a new financing package that includes austerity measures but not debt relief. Jul 5 - Greek voters reject a financing plan that includes austerity measures. Jul 1 - Puerto Rico's public utility company reaches a deal with investors to extend debt negotiations. The island owes $72 billion in debt and new congressional legislation could allow it to access US Chapter 9 bankruptcy protection. LA Times features Jubilee's views. Jun 30 - Debt crises in Greece and Puerto Rico highlight important international debates over austerity, debt and global bankruptcy proposals. The Associated Press, New York Times, Washington Post and thousands of outlets feature Jubilee's views. Jun 25 - The International Monetary Fund (IMF) will not give Nepal debt relief through its new emergency fund. The IMF says Nepal does not qualify because its earthquake did not cause enough economic damage. Nepal failed to raise the $6.6 billion it says it needs for earthquake recovery at an international donor conference. The International Business Times features Jubilee's views. Jun 19 - Negotiations on Financing for Development (FfD) conclude today as negotiators struggle to find consensus on debt, tax and trade policies. The FfD conference takes place in Addis Ababa, Ethiopia, in July. Jun 12 - "Fast Track" trade authority stalls in the US House, leaving international trade agreements like the proposed Trans Pacific Partnership on hold. Valuewalk features Jubilee's call to amend trade deals to protect the most vulnerable. Jun 8 - The G7 met in Germany last weekend for its annual summit. G7 leaders called for action on debt, tax and trade issues. Before the summit, religious leaders called on the G7 to address global poverty and to enact a global bankruptcy process. Accounting Today and Democracy Now! feature Jubilee's views. Jun 4 - The scandal surrounding FIFA, world soccer's governing body, highlights larger corruption problems in the global financial system. Jubilee supports bi-partisan legislation in Congress to improve transparency and make it harder for criminals to move dirty money around the world. The global wire service Agence-France Presse features Jubilee's views. May 25 - Executive Director Eric LeCompte is in Dresden, Germany, chairing events during for the G7 Finance Ministers Meeting. On the eve of the ministerial meeting, Dresden Catholic and Protestant Bishops called for a global bankruptcy process to end poverty. German Finance Minister Wolfgang Schauble attended the Jubilee prayer service. May 18 - Our Executive Director Eric LeCompte is in Mexico City today addressing the International Bar Association on the importance of a global bankruptcy system. He's speaking alongside the lead lawyers in the Argentina/NML Capital debt dispute. May 15 - After a second earthquake strikes Nepal, the country's total death toll exceeds 8,000. Nepal pays nearly $600,000 per day on debt and needs immediate debt relief to free up resources to support its people. Take Action Today for Nepal Debt Relief: Sign our petition calling on the International Monetary Fund and World Bank to cancel Nepal's debt. Read our views in Reuters and the International Business Times. Mar 13 - Pope Francis celebrates his second anniversary of his election to the Papacy. As head of the global Catholic Church, the Pope emphasizes ending poverty and addressing global inequality. 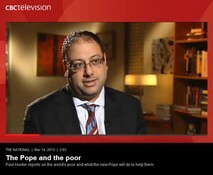 Our views on the "Jubilee" Pope are featured on National Public Radio's Marketplace. May 12 - Jubilee is working to win billions of dollars to end poverty through the Financing for Development process. Governments meet this week in New York to plan for the major poverty summit this summer in Ethiopia. Our views featured in International Business Times and Reuters. Apr 30 - Chad receives $1.1 billion in debt relief from the International Monetary Fund and the World Bank. Chad is the fourth-least developed country in the world. Jubilee's views appear in the Agence-France Presse and the International Business Times. Apr 25 - A 7.8 magnitude earthquake strikes Nepal, killing nearly 4,000 people. Nepal is one of 38 countries eligible for the IMF's new debt relief fund. It owes $3.8 billion in debt, including $1.5 billion to the World Bank. Jubilee's views are in Bloomberg, International Business Times, the Epoch Times and Voice of America. Apr 23 - Campaigns Director Andrew Hanauer speaks at the United Nations on debt and tax policies that can lift millions of people out of poverty. Apr 23 - Greece meets with its creditors regarding its deepening debt crisis. Jubilee Executive Director Eric LeCompte is quoted in the New York Times and the Associated Press. Apr 17 - During its spring meetings the IMF discusses a global bankruptcy process, a key Jubilee reform. Apr 17 - The World Bank announces $650 million in aid and loans to Ebola-affected countries. Apr 17 - Jubilee USA hosts a workshop on Ebola debt relief and the new IMF debt relief trust fund for poor countries. Our executive director will speak alongside senior IMF and World Bank staff. Join us! Apr 15 - The IMF releases its Global Financial Stability Report, noting debt and human crises are driving global inequality. Apr 9 - Grenada reaches a debt deal with investors as Caribbean religious leaders push for reforms to protect the poor. The deal can serve as a precedent for other Caribbean debt restructurings. The Wall Street Journal, Reorg Research and Bloomberg feature Jubilee's views. Apr 9 - Executive Director Eric LeCompte speaks at the United Nations on promoting debt, tax and trade policies that protect the most vulnerable. Our Board Co-Chair Aldo Caliari co-moderated the panel. Apr 3 - Jubilee USA calls for debt relief for Vanuatu. The small island nation owes $84 million to international lenders and needs immediate assistance to recover from a category 5 cyclone. Apr 2 - Greece submits new reform proposals to the European Union targeting tax evasion and corruption in an effort to secure further emergency financing. Questions remain as to whether Greece will make its next payment to the International Monetary Fund on schedule. The International Business Times features Jubilee's views. Mar 27 - Victory! From Oregon to Florida, Jubilee USA generated thousands of calls and stopped the Senate from repealing a global financial transparency law. Mar 26 - The Senate is voting this week on an amendment aimed at repealing a key US anti-corruption law. Act today! Call your senators and urge them to vote No on SA 621. Mar 10 - President Obama signs a "Student Aid Bill of Rights", which includes protections for students from predatory lending practices. Feb 25 - New legislation would allow Puerto Rico to access US bankruptcy protection. Puerto Rico is heavily indebted and impoverished, but its unique status as a territory leaves it few options to escape its debt trap. Feb 25 - CCTV America and America Magazine interview our executive director Eric LeCompte on Greece, debt, austerity and tax evasion. Jubilee's views on the Greek elections are in the Financial Times and ValueWalk and our views on Greece's loan deal with the Eurozone are in Valuewalk. Feb 20 - Greece reaches a loan deal with the European Union. ValueWalk features Jubilee's views on Greece, Germany and debt. Feb 2 - President Obama tells CNN that Greece needs a growth strategy and that austerity policies "squeeze more and more out of a population that is hurting." Jubilee's views on the Greek elections are in the Financial Times and ValueWalk. January 30 - The UN Economic Commission for Africa calls for debt cancellation for Ebola-impacted countries. January 25 - An anti-austerity party wins Greece's elections and promises to renegotiate Greece's debt. Greece is the third most heavily indebted country in the world. See Jubilee's views in the Financial Times and ValueWalk. January 23 - An anti-austerity party is poised to win upcoming Greek elections. Is the time right for a repeat of the 1953 London Conference that addressed Germany's post-war debt problems? January 12 - Today marks the five-year anniversary of Haiti's earthquake. After the quake the International Monetary Fund created a new debt relief fund that could now help Ebola-impacted West Africa. January 8 - CCTV features Jubilee's debt relief efforts for West African countries affected by Ebola. December 30 - Jubilee's views on the on-going dispute between Argentina and predatory hedge funds are featured in Fox News, the New York Times, the Associated Press and the International Business Times. December 26 - New reports show Ebola-impacted countries losing billions to debt, tax evasion and corruption. December 16 - Our 2014 Year-End Report is hot off the press. We are winning because of you. December 15 - According to a new report from Jubilee partner Global Financial Integrity, the developing world loses nearly $1 trillion each year to corruption and corporate tax evasion. December 15 - The UN Economic Commission for Africa calls for debt relief for Ebola-impacted West African countries. December 5 - The UN votes 128 to 16 to begin next steps on the global bankruptcy process it approved in September. Jubilee's views are featured in the International Business Times. December 4 - Take Action Today for Ebola Debt Relief! Thank Treasury Secretary Jack Lew for supporting debt relief for Liberia, Sierra Leone and Guinea. December 2 - Today is #GivingTuesday, a day for donating to worthy causes. Your tax-deductible gift to Jubilee today is matched up to $15K! November 26 - The Financial Times features Jubilee USA's views on what forms of debt predatory hedge funds might target next. November 12 - Jubilee moved the White House to call for $100 million in debt relief for Ebola-stricken West Africa. Jubilee's efforts are featured in Inter Press Service and the International Business Times. October 29 - The three countries most impacted by Ebola spend nearly $200 million per year paying off debt. Guinea spends more on debt than on public health - and loses even more to corporate tax avoidance and illicit financial flows. October 7 - The IMF releases its new World Economic Outlook Report, forecasting slow growth amid high debt levels and calling for increased infrastructure investment. October 6 - The IMF releases a new proposal aimed at preventing holdouts from blocking debt restructurings. Jubilee's views were covered by the BBC. October 3 - Executive Director Eric LeCompte and Jubilee USA's work on debt and predatory hedge funds is featured on National Public Radio's Interfaith Voices. Listen here. September 29 - A US District Judge finds Argentina in contempt of court over its attempts to avoid paying holdout hedge funds. September 23 - The US Treasury Department acts to stop corporate inversions. September 17 - The OECD proposes international structures to stop corporate tax avoidance, a systemic cause of global poverty. September 9 - The United Nations votes to create a global bankruptcy process that could deter predatory funds. The resolution passed by a vote of 124-11. Jubilee USA's views are covered in ValueWalk and Foreign Policy Magazine. September 4 - Jubilee USA's executive board sends a letter to US Ambassador to the UN Samantha Power urging her to vote for a UN resolution to curb predatory behavior. September 2 - The United Nations conference on small island developing states meets in Samoa. Jubilee USA argues that the conference fails to address the underlying debt and tax crises these islands face. August 28 - A group of banks and investors propose a framework for handling debt defaults aimed at preventing a repeat of the Argentina/NML dispute. Jubilee's views are covered in the Financial Times, International Business Times and the New York Post. The framework is available here. August 7 - Argentina sued the United States today at the International Court of Justice. The suit stems from Argentina's legal dispute with hold-out creditors. August 5 - In the wake of Argentina's default, Jubilee USA's Executive Director addresses the United Nations about the global impacts of the Argentina/NML case. Jubilee's views on the case are covered in The Wall Street Journal and NPR's Marketplace. Grenada and the Democratic Republic of the Congo are two countries that could be impacted by the Supreme Court's ruling. July 22 - A US District judge orders Argentina and hold-out creditors to meet with a court-appointed mediator and negotiate "continuously." The history of the case is detailed in Jubilee USA's timeline. 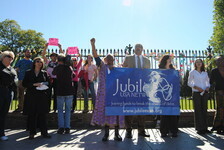 Learn more about the case's global impacts in Jubilee USA's Supreme Court filing. June 27 - A US District judge blocks Argentina's attempt to make debt payments to the majority of its creditors, ordering Argentina to also pay hold-out creditors in full. Argentina has argued that it cannot pay the hold-outs without facing more than $100 billion in lawsuits from other creditors, thus triggering a potential default. June 25 - According to a new IMF paper, corporate tax avoidance hurts the global economy, and poor countries most of all. June 23 - In a speech on poverty, World Bank President Jim Kim states: "Two of the most important impacts on growth in Africa over the last 5 years... have been 1) the Jubilee movement, debt relief...and 2) HIV treatment." June 20 - The IMF releases a major paper focused on increasing financial stability and ending predatory behavior. Jubilee's views are covered in the Financial Times. June 17 - Argentina announces a plan to continue paying its creditors without paying predatory hedge funds. Read the story in Bloomberg's Businessweek, see Jubilee's press release. June 16 - The Supreme Court rejects Argentina's appeal for a hearing in the "Debt Trial of the Century." See Jubilee's views in the Associated Press, Bloomberg, Washington Post, NPR, Democracy Now! and Time. June 13 - The International Monetary Fund Executive Board meets to discuss responsible lending and borrowing, predatory hedge funds and aspects of an international bankruptcy process. Read Jubilee USA and New Rules for Global Finance's letter to the Fund. June 5 - The G7 finished its meetings in Brussels today. The summit addressed the need to find solutions to the global debt crisis and to stop corporate tax avoidance in the developing world. Read Jubilee's release and statement. May 27 - Argentina filed its final arguments at the US Supreme Court in its dispute with holdout predatory hedge funds. Jubilee's amicus brief was filed in March and explains how the case affects global poverty, debt restructuring and poor country access to credit. The high court will likely decide in June if it will hear the case. Listen to Eric LeCompte's national radio interview. See Jubilee's press coverage in the Wall Street Journal, Mint Press, the National Catholic Reporter and the Argentine press. Read Argentina's original petition for a hearing. May 27 - Pfizer halted its tax avoidance plans amidst heavy scrutiny. Jubilee's statement welcoming the decision argues that corporate tax avoidance is a "theft from the poor." May 21 - Our Executive Director, Eric LeCompte, led a global Jubilee delegation to the Vatican and met with Pope Francis today. Yesterday they were formally received by Vatican Secretary of State Cardinal Parolin and Cardinal Turkson who applauded Jubilee for bringing together Muslims, Jews and Christians to work on financial reforms to end poverty. Read more about the meetings in the National Catholic Reporter, Catholic News Service and the Vatican press. 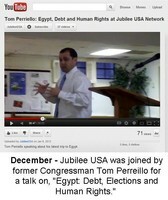 May 5 - Jubilee USA is featured in Tony Campolo's Red Letter Christians. Read Eric LeCompte's oped in Inter Press Service on Jubilee USA's newest regional partner The Caribbean Debt Network. April 25- Jubilee USA is proud to support our newest regional partner, the Caribbean Debt Network. Read Eric LeCompte's oped on the inspiring work being done by Jubilee communities in the Caribbean. April 19 - Jubilee USA's Spring E-Update is out! Learn more about the work we are doing and how you can get involved. April 18 - While the Supreme Court debates whether or not to hear the "Debt Trial of the Century," a related case between Argentina and predatory hedge funds is being heard by the high court. On March 25th Jubilee USA and 78 religious and development organizations filed to the US Supreme Court on the NML/Argentina debt case. The filing expresses concern for the case's impact on the poor and on bipartisan US policy. Read Jubilee's brief and the list of organizations that filed. Listen to Eric LeCompte's national radio interview. See Jubilee's press coverage in the National Catholic Reporter, Wall Street Journal, Mint Press and the Argentine press. Read Argentina's petition. April 11 - As IMF meetings focus on debt and inequality, see Jubilee USA's views in Common Dreams. March 25 - Jubilee USA and 78 religious and development organizations filed to the US Supreme Court on the NML/Argentina debt case. The filing expresses concern for the case's impact on the poor and on bipartisan US policy. Read Jubilee's brief, the list of organizations that filed and our press release. Listen to and read Eric LeCompte's national radio interview. See Jubilee's recent coverage on the case in the National Catholic Reporter, Wall Street Journal, Mint Press and the Argentine press. March 21 - Jubilee USA and 75 religious and development organizations will file to the US Supreme Court on the global implications of the NML Capital vs Argentina case on Monday. Read our press release. Also read Eric LeCompte's comments to the Wall Street Journal on this landmark case. March 13 - Today marks the one-year anniversary of Pope Francis' installation as head of the Catholic Church. Read Jubilee USA's statement on the Pope's anniversary. February 28 - The Daily Californian covered Jubilee's unity event to end extreme poverty that was sponsored by the UC Berkeley College Republicans, Democrats, and Jewish, Muslim and Christian groups on and off campus. Eric keynoted the event that will become a model for universities around the US to bridge political and religious divides to solve structural causes of extreme poverty: debts, taxes and corruption. You can read more about the event through The Daily Californian's article here. February 18 - Argentina officially files final Supreme Court appeal in landmark debt case. Read Jubilee's press release. Read Argentina's petition. February 14 - Argentina prepares to file final Supreme Court appeal in global predatory hedge fund debt case. The religious community joins the IMF, the US government and the United Nations in opposing exploitative hedge fund behavior. Read our press release. Jubilee's Executive Director, Eric LeCompte, spoke about the twists and turns of the case in January to HedgeCo.net. For a timeline on the Argentina/NML Capital Case visit here. Feb 5 - Ebola Debt Relief Victory: The International Monetary Fund announces $170 million in Ebola debt relief and creates a new debt relief fund for disaster-impacted countries. This is the culmination of Jubilee's major campaign for Ebola debt relief. Our views are in the Wall Street Journal, Reuters, Financial Times, National Public Radio's Marketplace, Voice of America and Catholic News Service. January 24 - Read Jubilee's press release on the 2014 World Economic Forum in Davos, Switzerland and the imperative for world leaders to address tax avoidance. Developing countries lose billions of dollars each year to tax avoidance, money that should be spent on education and health care for some of the world's poorest people. Between 2000 and 2008, $6.5 trillion left the developing world untaxed, leaving poor countries more in need of loans and aid. January 16- Read this article on predatory hedge funds from HedgeCo.Net. Jubilee's Executive Director, Eric LeCompte, is featured to explain the importance of this issue and its relation to the Supreme Court case, Argentina v. NML Capital. January 6 - Start the new year by giving a tax-deductible donation to Jubilee USA. Check out Jubilee's latest in-depth e-update and 2013 year-end report. December 27 - Jubilee Director Eric LeCompte was interviewed on Democracy Now! around debt and humanitarian crisis in the Philippines and global financial reform. Watch it here. Since Typhoon Haiyan struck the Philippines, the country has paid over $1 billion in debt payments - more than twice as much as they've received in relief aid. Some of the debt still being paid is from the abusive Marcos regime. Sign our petition today to grant an immediate moratorium on the Philippines' debt repayments, and to offer unconditional grants--not loans--to help the country recover. Read more in Jubilee's release on Common Dreams. Update, Feb. 14, 2014: As of today, the Philippines has made more than $2 billion in debt payments since the Typhoon, money that should be going to help the victims of the storm and to rebuild the country. December 26 - Please enjoy Jubilee's latest in-depth e-update and our 2013 year-end report. December 17 - Argentina is expected to appeal to the US Supreme Court by mid-February in response to the US 2nd Circuit Court ruling in favor of predatory hedge funds. The precedent the case sets empowers a small group of hedge funds to target assets that benefit vulnerable populations. The nearly 93% of debt holders who restructured are now pressing for a solution. Read Jubilee's latest press release. Learn more about this global poverty debt case. December 12 - Take action and tell your Senators and Representative to support legislative measures for responsible lending and borrowing at the IMF, World Bank and other International Financial Institutions. Such measures would benefit the world's poorest and most vulnerable. Learn more about our work with the IMF in Jubilee Director Eric LeCompte's OpEd: Grenada's IMF Sunday School in Inter Press Service. December 5 - Representatives Doggett and DeLauro introduce legislation to end sequestration and curb corporate usage of offshore tax havens. Jubilee applauds the bill that helps millions of people escape poverty. Read our statement on Common Dreams. December 4 - The EU fined eight financial institutions a combined total of $2.3 billion for their alleged role in the manipulation the London Interbank Offered Rate (LIBOR). The manipulation of LIBOR is one of the largest banking scandals of our time. Read Jubilee Director Eric LeCompte's statement on how this manipulative behavior impacts the most vulnerable. November 26 - Jubilee's Executive Director spoke at the United Nations today during the Open Working Group on Sustainable Development. Read his comments on debt, tax, the IMF and vulture funds. November 18 - In the landmark debt case between vulture funds and Argentina, the US 2nd Circuit ruled for predatory hedge funds and against the interests of the global poor. We expect Argentina to file an appeal to the US Supreme Court. Read Jubilee Director Eric LeCompte's statement. November 6 - Jubilee USA and American Jewish World Service hosted a congressional briefing on responsible lending and borrowing and vulture funds. Check out speeches from our esteemed panel and read the statements from Financial Services Committee Chairman Emeritus Spencer Bachus and Financial Services Committee Ranking Member Maxine Waters here. Read more in our coverage in Inter Press Service. November 1 - A US Appeals Court rejected vulture funds' request to remove hold on payments in the landmark debt case between Argentina and vulture funds. Read more in Jubilee USA's statement. October 11 - Jubilee USA is working to get a fair debt deal for Grenada that will benefit its citizens. Learn more in Eric LeCompte's Op Ed in Inter Press Service. Read the letter Jubilee's executive committee sent to IMF Head, Christine Lagarde. Read the Conference of Churches in Grenada's original statement. October 10 - The IMF announced that member countries approved their commitment to fund the Poverty Reduction and Growth Trust (PRGT) for concessional lending. Financing comes from windfall profits made from IMF gold sales. Jubilee led a three year campaign to secure windfall profits to go to benefit the poor. We still have concerns over aspects of lending, however, zero percent interest loans mean real relief for millions of the world's most vulnerable people. See our coverage in Inter Press Service, the Independent European Daily Express and the Pakistan Observer. You can read more about our IMF gold sales victory in Agence France-Presse (AFP), Yahoo News, the Global Post and the South China Morning Star. October 7 -The U.S. Supreme Court decides not to take the Argentina and NML Capital debt case. Further appeals are pending in lower courts and the Supreme Court will likely have another chance to accept the case in the coming months. Read Jubilee's reaction in our press statement. See Jubilee's thoughts on the case in the Washington Post, the Financial Times and the Los Angeles Times. Read Eric's OpEd in Yes! Magazine and get more details on the case from our vulture funds page. September 19 - The Senate version of the Stop Tax Haven Abuse Act was introduced. This legislation calls on corporations to stop avoiding paying taxes in the developing world. Take Action and ask your Senators to cosponsor this legislation. September 6 - The G20 meeting concludes in Russia and delegates released their leaders' declaration. Read Jubilee USA's statement. September 5 - Jubilee USA Network, United to End Genocide and Physicians for Human Rights sent a letter to the White House on establishing preemptive contract sanctions on the Syrian government. This action deters companies from selling weapons and protects future Syrian generations from inheriting illegitimate debts. The groups also sent a letter to New York Governor Andrew Cuomo who has similar executive powers to address Syria in our proposal. August 19 - Norway becomes first lending country to audit loans made to developing countries. The audit finds some past loans wouldn't meet current UNCTAD principles on responsible lending. Read about Jubilee's perspective at Inter Press Service. 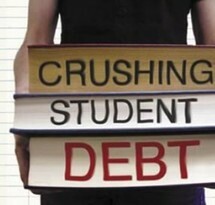 August 1 - Congress passes Senate student loan compromise. Read Jubilee's press statement. Thanks to the 60 Jubilee communities that prayed and acted for student debt relief. July 5 - Jubilee USA's Executive Committee thanks President Obama for standing up to vulture funds. Read the letter we sent to the White House. Sign our thank-you letter to President Obama for working to stop vulture funds. July 1 - Student loan interest rates doubled for nearly 7 million college students. Read our press statement. On the weekend of June 21st, over 60 faith communities prayed to protect our students' futures in our Jubilee for Students. June 28 - President Obama is traveled to the African nations of Senegal, Tanzania and South Africa from June 26-July 3. Read our backgrounder and recommendations and our press statement on Common Dreams. June 18 - Jubilee USA is quoted on a lead story by CNN Money on the G8's historic declaration on corporate transparency and tax avoidance. The declaration notes that wealthy nations are responsible for multinational companies and must make sure these companies don't dodge taxes in poor countries. Jubilee's Director, Eric LeCompte, is quoted in the Guardian and National Catholic Reporter. June 13 - Jubilee USA applauds the EU for passing important profit and tax reporting for extractive industries operating in the developing world. Read our press statement to learn about these vital global poverty issues. May 22 - European Ministers address international tax evasion and back Obama plan for global information sharing. See Jubilee's press statement. May 1 - Tell Congress to cosponsor the Stop Tax Haven Abuse Act (HR1554). This legislation addresses a systemic cause of poverty - the fact that many multinational corporations don't pay taxes to developing and poor countries. A key way this legislation curbs tax avoidance is by requiring country-by-country reporting of corporate payments to governments. Read Jubilee's press statement on Common Dreams. April 18 - At the International Monetary Fund spring meetings, Jubilee's Director, Eric LeCompte, was quoted in the Washington Post, NBC, CBS, the Miami Herald, the Associated Press, Agence France-Press and thousands of other outlets. During the IMF meetings, G20 financial ministers met to discuss debt and tax issues. Our reactions were shared globally in French and Spanish in an Agence France-Press article. See it at El Espectador. April 15 - On Tax Day, Rep Lloyd Doggett (D-TX) introduced the Stop Tax Haven Abuse Act. This legislation closes offshore tax loopholes and requires country-by-country reporting of corporate tax payments to both developed and developing nations. This reporting is critical to curbing illicit financial flows, a systemic cause of poverty. Read Jubilee's press statement on Common Dreams. April 9 - The EU agreed on Accounting and Transparency Directives. This law will order EU-listed and non-listed oil, gas, mining and logging firms to declare their payments to governments in countries where they operate - much like Dodd-Frank Section 1504 in the US. Read our statement in Common Dreams on what this means for the world's most vulnerable. 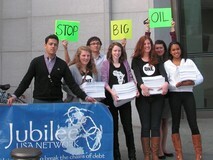 March 21 - Jubilee USA and the FACT Coalition organized and sent a letter to Senators to close offshore tax loopholes. Closing these corporate tax loopholes sends a message around the globe that corporate tax avoidance is unacceptable whether it be in the developing or developed world. Read our press release. March 7 - Senator Carl Levin (D-MI) announces he will not seek reelection in 2014. Read Jubilee USA's statement. February 26 - Eric LeCompte met with the German Embassy in DC on the eve of the London Accord. The Accord gave needed debt relief to Germany that was crucial to pave the way for their "economic miracle." Eric spoke about how this model could help nations that are highly indebted. February 11 - Senators Carl Levin (D-MI) and Sheldon Whitehouse (D-RI) introduced the Cut Unjustified Tax Loopholes Act (CUT Loopholes Act). With the sequester right around the corner, this legislation would generate billions for the US by ending loopholes that allow the wealthiest corporations to dodge paying their fair share of taxes. This legislation would send a global message to end corporations' use of tax dodging that affect every day Americans and the world's poorest. Read our press statement. February 7 - Senator Bernie Sanders (I-VT) and Representative Jan Schakowsky (D-IL) introduced the Corporate Tax Fairness Act that would generate more than $590 billion over the next ten years by closing offshore tax havens. This legislation would send a strong message that this kind of corporate behavior worldwide is unacceptable. Read Jubilee USA's press statement. Read the letter Jubilee USA signed in support of the legislation with dozens of partner organizations. Spring 2015 - On April 25, a 7.8 magnitude earthquake struck Nepal, killing over 8,800 people and destroyed over 500,000 homes, 8,000 schools and 1,023 health centers. Nepal is one of the poorest countries in the world and owes $3.8 billion in debt, including about $1.5 billion each to the World Bank and Asian Development Bank. Thanks to Jubilee's efforts, Nepal is potentially eligible for $23 million in debt relief from the International Monetary Fund's new debt relief trust fund for countries impacted by natural disasters. We are running a campaign to win debt relief for Nepal from the IMF and to move the World Bank to create its own emergency relief fund and cancel Nepal's debt. Jubilee's views on Nepal appear in Bloomberg, the International Business Times, Reuters, Inter Press Service and more. Summer 2014 - On June 16, the US Supreme Court rejected Argentina's appeal for a hearing in the "Debt Trial of the Century." The case dates back to Argentina's 2001 debt default and pits the South American country against a group of predatory hedge funds seeking more than $1.5 billion. Jubilee USA filed an amicus brief to the high court this March, urging the court to take the case and noting the negative impact a ruling in favor of the predatory funds would have on poor countries, debt restructurings and legitimate investors. On July 30, Argentina defaulted. Jubilee USA's views on the case are featured in the Wall Street Journal, National Public Radio, the Financial Times, Time Magazine and more. Jubilee's executive director Eric LeCompte addressed the United Nations about the case in August. A complete timeline of the case is available on our website. Fall 2014 - On September 9, 2014, the United Nations General Assembly voted overwhelmingly to begin work on a global bankruptcy process. That process - one of Jubilee's core issues since our founding - could make defaults less likely and halt predatory hedge funds. The resolution passed 124 - 11 with almost unanimous support in Latin America and Africa. Jubilee organized thousands of messages to United States UN Ambassador Samantha Power urging her to vote yes. In December, the UN reaffirmed the process with two more resolutions. Foreign Policy, the Guardian, International Business Times and ValueWalk featured our work. November 6, 2013 - Jubilee USA and American Jewish World Service hosted a congressional briefing on responsible lending and borrowing and vulture funds. Check out speeches from our esteemed panel and read the statements from Financial Services Committee Chairman Emeritus Spencer Bachus and Financial Services Committee Ranking Member Maxine Waters. Read more in our coverage in Inter Press Service. Jubilee's views on vulture funds have been covered in thousands of outlets across the globe, including the Inter Press Service (8/27), the Associated Press (8/23), the Wall Street Journal (8/23), Washington Post (8/23), the Los Angeles Times (8/23), NBC, ABC, CBS, the National Catholic Reporter (8/23) and the Financial Times (6/27). Additionally, Eric published an Op-Ed in Yes! Magazine (4/22). October 11, 2013 - Jubilee is working to get a fair debt deal for Grenada that will benefit its citizens. Eric traveled to Grenada this year to participate in negotiations between the IMF, Grenada government, international experts and civil society representatives. Read the letter Jubilee's executive committee sent to IMF Head Christine Lagarde. Learn more about the issue through Eric LeCompte's Op Ed in Inter Press Service and the original statement by Grenada's Conference of Churches. Fueled by recurring financial crises, corruption and loans made to Caribbean countries in the aftermath of natural disasters, several Caribbean nations are suffering debt crises that have deep impacts on the poorest people. Jubilee is supporting a new Jubilee Caribbean Debt Relief Network in order to cancel debt and set precedents that can impact millions of people living in extreme poverty around the globe. Learn more in Jubilee's blog post, Winning a Fair Debt Deal for Caribbean Nations. July 5, 2013 - Join Jubilee USA in thanking President Obama, US Treasury and the Justice Department for protecting our economy from destabilizing forces and for standing up to hedge funds that exploit the poor. Sign our thank-you letter to President Obama. Jubilee USA Executive Committee thanks President Obama for standing up to vulture funds by sending this letter to the White House. June 18, 2013 - G8 Summit leaders released a historic declaration that promotes corporate transparency and calls for and end to corporate tax avoidance. The G8 declaration notes that wealthy countries have a responsibility to ensure that multinational companies don't dodge taxes in poor countries. The G8 leaders also noted how important it is to stop corruption within oil and extractive industries. Jubilee's Director, Eric LeCompte, is quoted in a lead story at CNN Money, in Andrew Sparrow's Guardian blog and in National Catholic Reporter. May 1, 2013 - Tell Congress, to cosponsor the Stop Tax Haven Abuse Act (HR1554) and address systemic causes of poverty. Read Jubilee's press statement on Common Dreams. April 18, 2013 - At the International Monetary Fund spring meetings, Jubilee USA was quoted in the Washington Post, NBC, CBS, the Miami Herald, the Associated Press, Agence France-Press, El Espectador and thousands of other outlets. April 11, 2013 - Jubilee's Director, Eric LeCompte, was quoted on the election of the new Pope in the Washington Post, Boston Globe, Bloomberg and more than 20,000 other news outlets. March 25, 2013 - Thanks to you, the bipartisan Levin(D)/Hatch(R) Amendment 708 passed the Senate Budget Resolution! The passage is part of a global movement to ensure that corporations are accountable to the most vulnerable. Read more in our press release. Jubilee's work brought Senator McCain to the table as well. Earlier in the year, Senator Levin introduced the Cut Unjustified Loopholes Act which proceeded the budget action. December 20, 2012 - Jubilee USA's leadership went to the White House to meet with Gayle Smith, Senior Director of the National Security Council and President Obama's Special Assistant. They moved forward specific recommendations to build an international economy that serves, protects and promotes the participation of the most vulnerable. December 10, 2012 - Jubilee USA successfully moved the White House to raise the issue of corporate tax during the "fiscal cliff" negotiations. As 2012 closed, Jubilee pushed our solution to avoid falling over the cliff - closing offshore tax loopholes. Curbing this behavior would not only cover the $109 billion in spending cuts but it would benefit the world's most vulnerable. Closing these loopholes sends a message that this type of corporate behavior - that robs billions from the developing world - is unacceptable around the globe. We mobilized our grassroots and congregations to send messages and call their Members of Congress around the negotiations. Eric LeCompte was featured on radio airwaves from coast-to-coast. Jubilee joined negotiations on the Hill and met with the White House. We were pleased with the White House announcement to push for corporate tax overhaul in the cliff talks. In early 2013 we face another deadline that will revisit offshore loopholes and expanding revenue in the developing world. November 16, 2012 - ACT NOW - Urge Members of Congress to support responsibility, accountability and transparency at the International Monetary Fund. 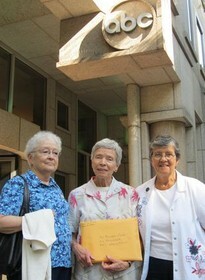 October 5, 2012 - The Sisters of Charity of New York delivered thousands of Jubilee petitions to NBC Nightly News and ABC World News to urge them to stop their blackout coverage of the LIBOR banking scandal. Read about the story in the Wall Street Journal. The bank manipulation of a critical interest rate impacts all of us - from home mortgages to credit cards - its effects are wide-ranging, especially for the poor and most vulnerable. Jubilee USA Network, the Interfaith Center on Corporate Responsibility and the Missionary Oblates of Mary Immaculate sent these letters to NBC Nightly News and ABC World News. September 28, 2012 - The Executive Board of the IMF approved the final amount of nearly $4 billion from their windfall gold sale profits to support concessional lending to low-income nations through the Poverty Reduction and Growth Trust (PRGT) and extend a 0% interest rate that will make this trust available for future generations beyond 2014. This momentous move has been two years in the making and we are very excited to see our work translating into real relief for some of the world's poorest people. Click here to read our press release. Click here to learn more about our efforts around IMF Gold. August 22, 2012 - A victory for transparency and anti-corruption was won when the Securities and Exchange Commission (SEC) ruled in our favor to implement the Cardin-Lugar Rule of Dodd-Frank. This ruling promotes greater transparency in the dealings of oil, coal and extractive industries in the developing world. Our efforts were highlighted in the SEC's final public ruling! Earlier this year, we collected over 110,000 petitions with the ONE campaign to deliver to the SEC. These petitions asserted that the SEC should implement this legislation that was passed over a year and a half ago and reject the lobbying of the oil industry to weaken the rule. The Amendment was a coup for transparency in international finances and a step to help curb corruption. Click here to learn more. July 9, 2012 - The President signed bipartisan legislation to promote college affordability and protect low-interest college loans through the Transportation Bill. Jubilee applauds the bipartisanship in Congress and we thank the President for his leadership and Republicans and Democrats who reached across the aisle to make this happen. Read Jubilee's press statement. Months before, Jubilee mobilized supporters and engaged Congress Members to protect low-interest rates for students and minimize college student's future debt burdens before time runs out on July 1st, 2012. We sent a letter to Senators and had a weekend of prayer and action. Over 40 Jubilee faith communities prayed and acted for students. Over 1,600 supporters sent letters to their Senators. Learn more here. Read about Jubilee's work around the college student loan issue in Yes! Magazine, Catholic News Service and Eric's blog in Sojourners which talks about his visit to the White House to hear President Obama speak on student loans. And read our blog. July 30, 2012 - The White House hosted a conversation to discuss President Obama's Sub-Saharan African strategy with top Obama advisors. Eric LeCompte made the connections between debt and the African people being able to access their own revenue. He discussed implementing responsible lending and borrowing principles and curbing illicit financial flows to solve the debt crisis and promote growth in Africa. Watch the full discussion here (skip to 1hr 22min to listen to Eric). June 28, 2012 - The World Bank and International Monetary Fund recently announced that Cote d'Ivoire will get more than $4 billion cancelled. This is a positive step for the nation but does not address the debt's origins, how to prevent future unsustainable debt or how to get the Ivory Coast out of poverty. Learn more in our press release and our blog. June 24, 2012 - Jubilee USA stopped vulture funds and won a major victory for international debt relief in the New York State Legislature! We mobilized thousands of our New York Jubilee members to take action to stop vulture funds from using New York State Laws to prey on impoverished countries. See our action here. Read our press release featuring American Jewish World Service's President, Ruth Messinger, and Jubilee's work on stopping these funds in the Wall Street Journal. Learn more about vulture funds here. June 14, 2012 - Jubilee USA delivered our petition signed by thousands to the Mexican Embassy in Washington, DC urging the G20 to support mechanisms in accordance with a fair and transparent arbitration process (FTAP). Our message was well received during our meeting with two representatives from the Office of Economic Affairs. The petitions were delivered to Mexico's Minister of Finance ahead of the G20 meeting in Los Cabos, Baja California Sur, Mexico. Learn more here. June 11, 2012 - Jubilee USA co-sponsored an event with the government of Argentina on Argentina's economic recovery and sovereign debt. Jubilee USA's Executive Director, Eric LeCompte, and Argentina's Treasury Secretary, Hernan Lorenzino, spoke on vulture funds and responsible lending. Watch the full discussion and read more in our blog. May 24, 2012 - Jubilee USA and our counterparts at the Zimbabwe Coalition on Debt and Development (ZIMCODD) are calling for a debt audit to uncover the origins of $7 billion of Zimbabwe's debt. Send an email to Donald Kaberuka, the President of the African Development Bank and ask him to support a democratic audit of Zimbabwe's debts. May 1, 2012- In Doha, Qatar at the UN Conference of Trade and Development (UNCTAD) meetings, Jubilee USA worked with governments and international partners to secure a strong mandate on debt and responsible lending and borrowing. This major victory allows us to build an international consensus on responsible lending and borrowing. Read Jubilee's thank-you letter to President Obama for joining us in our efforts to win in Doha. 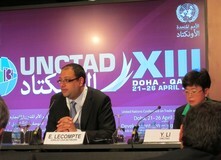 Jubilee's Director, Eric LeCompte, was hosted by UNCTAD to moderate a panel with 11 financial ministers and treasury heads from around the globe to speak in support of UNCTAD's principles on responsible lending and borrowing. Watch and hear the full panel discussion here. 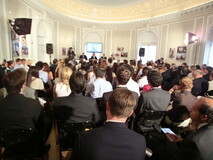 Read the UN press release on the panel here. Learn more about Jubilee's work to end the debt crisis and promote responsible lending and borrowing in our report. March 16, 2012 - Leprechauns descended upon the Irish Embassy! Representing the Anglo-Irish Bank and the European Central Bank, leprechauns hoarded pots of gold symbolizing money taken from the Irish to cover reckless loans and debts. Jubilee USA along with religious and policy organizations, delivered a letter to the Irish Embassy calling for the Irish leaders to suspend government payments on these loans, which will add up to $61.7 billion over the next twenty years. The citizens of Ireland are dealing with a damaged economy already, and are now being held responsible for loans run up by an irresponsible and now-dead Anglo bank. With a bit of luck, the Irish people will not be forced to pay this unjust debt, saving them billions of dollars to be put back into their economy and social services. Click here to see Jubilee's Reverend Seamus Finn and Eric LeCompte in the Huffington Post. March 8, 2012 - The Levin Amendment passed the Senate marking a huge victory for the world's poorest! Because of the work of Jubilee USA and the FACT Coalition, this Amendment will create accountability to stop tax havens and tax avoidance to ensure that money will go where it belongs - to help the people that need it the most in low-income countries. Learn more here. March 8, 2012 - Wahu Kaara, director of Kenya Debt Relief (Jubilee USA's Kenyan counterpart), was named one of Newsweek's 150 Fearless Women from around the world. She joined other figures ranging from Hillary Clinton, Oprah Winfrey, three 2011 Nobel Peace Prize winners and Egyptian revolutionary, Samira Ibrahim. Kenya Debt Relief has a pairing relationship with Jubilee San Diego. Ms. Kaara was born during the height of Kenya's independence struggle and was our featured speaker for Jubilee USA's Drop the Debt Tour in 2010. 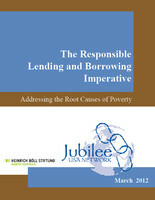 March 1, 2012- Jubilee USA released its report entitled the "Responsible Lending and Borrowing Imperative: Addressing the Root Causes of Poverty." 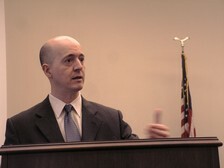 One of the report contributors, Aldo Caliari, briefed Congress on the principles. Mr. Caliari is a Jubilee Board and Network Council Member and director of the Rethinking Bretton Wood Project of the Catholic Center of Concern. February 10, 2012 - Jubilee USA along with members of the FACT Coalition, signed a letter to President Obama urging him to look at egregious corporate tax loopholes that reward companies that shift profits and jobs offshore. Click here to read the letter. Click here to learn more about Jubilee and tax justice. Fall 2011 - Jubilee, along with partner organizations, held a round table discussion on what we have learned from past experiences with restructuring sovereign debts, and what options are (or should be) available to today's and tomorrow's sovereign debtors. To learn more and listen to the full discussion, click here. 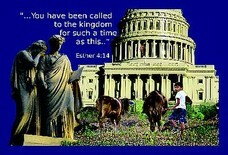 Spring 2011 - Join us in launching our newest campaign, the Voices of Esther. Like Queen Esther did for the Israelites, Jubilee activists will use their access to powerful decision-makers to raise our voices for the most vulnerable. As United States citizens, we should use our privilege of living in a democracy to bring the stories of the poor whose concerns are often overlooked. Urge your elected officials to expand debt relief and support responsible finance today. 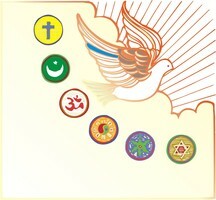 Spring 2011 - Jubilee USA is launching a new campaign to bring the voices of diverse faith traditions to the halls of the White House. Through the 1,000 Faith Leaders Initiative we will deliver a letter with more than 1,000 signatures of faith leaders from across the country to President Obama. The letter urges President Obama to expand life-saving debt cancellation and ensure responsible finance for the world's poorest countries. 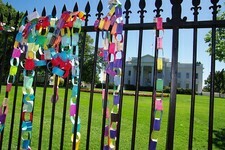 Fall 2010 - Jubilee USA brought thousands of multicolor paper chains from around the country and marched around the IMF and World Bank to the White House. Stories and photographs from our march and rally have covered the globe � AFP, AP, and Reuters have used images of your paper chains for their wire stories, a diverse group of bloggers have written on the event, and NBC, ABC, and FOX news stations included the march in their nightly newscast. Your activism made the news � CLICK HERE to check out all the media we�ve received! Why did we mobilize? On October 5, just before our incredible action, Jubilee USA hosted a standing room only Congressional Briefing on how the IMF should reform its practices. Summer 2010 - Jubilee USA Network welcomes the International Monetary Fund Executive Board�s decision to cancel Haiti�s $268 million debt to the institution in response to the January 12 earthquake, but is concerned over the IMF�s decision to provide $60 million in financing support as a new loan. Read the press release here. 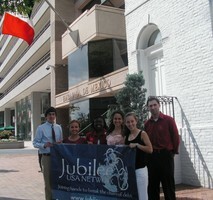 After January's devastating earthquake, Jubilee USA Network led the call for complete debt cancellation for the country. Thanks to efforts from supporters around the world, all of Haiti's donors have committed to debt cancellation. We are continuing to work to make sure that Haiti is freed from the chains of debt once and for all. Fall 2010 - On September 17-19, Jubilee USA participated in Stand Up! Take Action!, a weekend in which millions worldwide stand up to demand world leaders keep their promises to end poverty and inequality. The following week on September 23, President Obama recognized the need to keep our commitments to the world's poorest citizens. In response to the President's speech, Bishop Neil Irons of the Methodist Church published an Op-Ed in the Washington Post. READ about Jubilee chapters participation in stand-ups across the country and President Obama's address to world leaders. 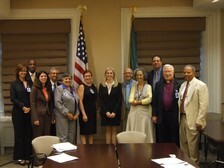 July 7, 2010 - Jubilee USA Network and religious leaders met with the Honorable Lael Brainard, Under Secretary for International Affairs, US Treasury Department. In the meeting, we thank the Administration for their work on cancelling Haiti's debt and had a robust dialogue on Jubilee USA's priorities including full funding of the U.S.'s debt relief commitments for the world's most vulnerable.